Disability Network West Michigan provides independent living resources for people with disabilities in Muskegon, Oceana, Newaygo, Lake, and Mason Counties. Disability Network West Michigan is committed to accessibility, inclusion, and diversity while being consumer directed and accountable. Our mission is to advocate, educate, empower, and provide resources for persons with disabilities. We promote accessible communities, fulfilling our vision of ensuring that accessibility will be an accepted civil right. 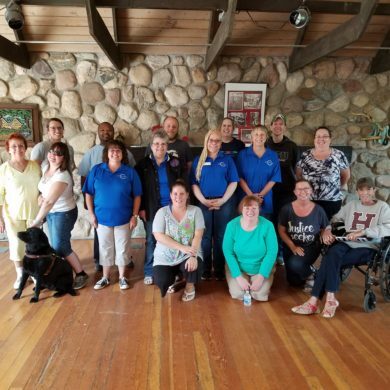 The Disability Network West Michigan crew is a close-knit group of people who deal with disability on a daily basis, Many of us have a disability, though not all are obvious. All of us have close friends and family members who have a disability. Our goal is to empower those with disabilities to advocate for themselves and create fulfilling lives here in West Michigan. We’re conveniently located in Muskegon, Newaygo, and Oceana. Call (231) 722-0088 for information or click below to get directions or send an email. Want to join us in our cause? We’d be happy to have you. We’re always looking for volunteers in a wide range of capacities. See how you can help your community today! Disability Network’s mission wouldn’t succeed without donations from generous people like you – thank you for your support!